Recently, I asked my followers on social media to ask me all of their fashion, beauty, and personal questions and boy did they bring it! Some of the questions that I received were really hard to answer, but that just made it all the more fun! Well, enough chit-chat! Let’s get to the good stuff! My all-time favorite foundation is Acne Solutions by Clinique! It dries matte, doesn’t break me out, isn’t cakey or heavy, and has great coverage! Whenever I wear foundation, this is my go-to! This was a tough one to answer! I think that, if I had to choose, I would say high-end makeup. I think high-end products are mostly great and high quality, vs. drugstore brands which are about 50-50. This doesn’t mean that I don’t love drugstore products, because, if you have been reading my blog and following my Instagram for a while, you know that I wear them all the time! This was definitely the hardest question to answer. My one biggest beauty tip ever would be to never buy anything without reading reviews about it on multiple blogs/Youtube and Makeup Alley! Seriously, this is what I do before buying anything beauty related! I usually read about 3-5 reviews on a product before even going into the store to look at it. This is an easy one! My favorite singer is Lady Gaga! She’s my favorite not only because of her amazing singing voice and performances but also her powerful messages of self-worth and positivity. When I feel down, I remember her positive messages, and I start to cheer up! Also, her acting in American Horror Story was fantastic! AHS is one of my favorite shows. I’ve had many strange memories throughout my life (who hasn’t? ), but I have to say that the strangest memory that I can remember was when I was 4 years old and my 2-year-old sister stole my play makeup! She put bright, colorful makeup all over her face (including her eyebrows)! It was hilarious! I still remember the eyeshadow all over the bathroom counters. It’s one of my favorite memories! I think that, out of all the amazing makeup products, I couldn’t live without mascara! Even if I don’t wear any face makeup, I never leave the house without a coat of mascara. I’m a proud mascara junkie! Until my next post, fashionistas! Thank you to everyone who participated in the Q & A! As always, I love my lovely readers! 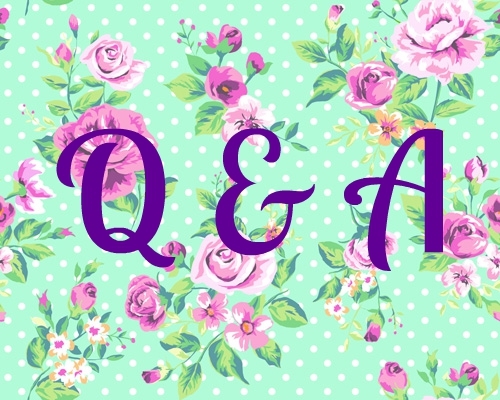 Also, If you have any other questions you want to ask me, feel free to leave them in the comments below! Previous Post L’OREAL Hair Extraordinary Oils Review! Next Post BYBB Makeup Palette REVIEW! Love reason Q&A’s you can really get to know someone! How fun! Love doing Q & A! Thank you so much for including my question!